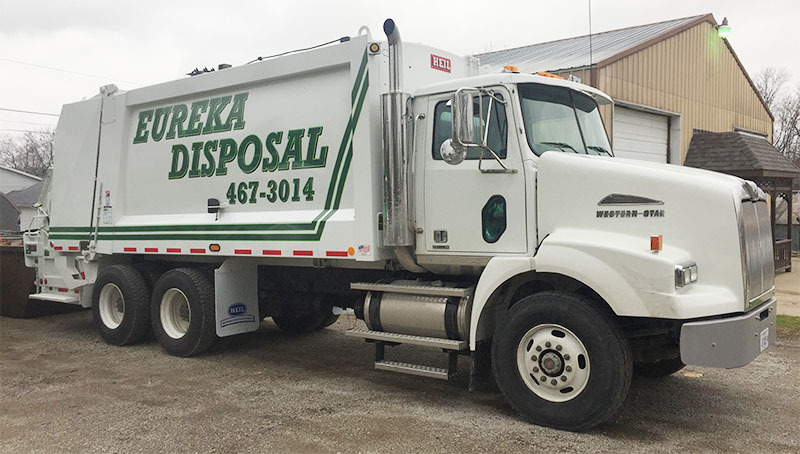 Eureka Disposal has been serving Eureka, Secor, and the surrounding area since 1968. We are not only family owned and operated but we are Veteran owned as well. In 1968 Donald and Roger Miller bought Eureka Disposal Company. Donald was an Army Veteran and Roger is a Vietnam Veteran. In 2014 Michael and Stephanie Miller bought the business. Michael served six years in the Navy and is an Iraq and Afghanistan Veteran. We have proudly served this great country and now we would like the honor to serve you! We offer fair rates and great customer service for residential, commercial, and roll-off service to Eureka and the surrounding area. Please call us for rates and details. * items not allowed in dumpers: tires, batteries, liquid paint, oil, chemicals, yard waste, brush, appliances, TVs, computers, electronics, animal carcasses, L.P. tanks. If it's questionable please call us. What holidays do you take off? New Year’s Day, Memorial Day, Fourth of July, Labor Day, Thanksgiving Day, Christmas Day We do not work on these 6 days. If one of these holidays falls on your regular day we will pick up your trash on the following day along with all regular routes for that day. What can't go in the trash? Tires (truck, auto, farm, etc. ), storage batteries (automotive), liquid paint (dried paint is accepted), oil, chemicals, yard waste, brush, appliances (refrigerators, ranges, freezers, air conditioners, humidifiers, dehumidifiers, stoves, ovens, water heaters, clothes dryers, washers, dish washers, water coolers, heat pumps, chillers, furnaces, and boilers), TVs, computers, electronics, animal carcasses, L.P. tanks, medical sharps, and mercury thermostats. If it's questionable please call us. My garbage bill went up, why? We do everything we can to keep rates low and competitive. Our largest expense is the landfill and it goes up thousands of dollars every year. Unfortunately, we can't absorb this cost every year and must raise rates. I've heard a rumor that Eureka Disposal has high roll-off rates. Is that true? NO!!!! We price shop our competition to make sure our rates are fair. If you need a dumpster in or around Eureka (Secor, El Paso, Roanoke, Benson, Metamora, Germantown Hills, Washington, East Peoria, Goodfield, Congerville, Deer Creek, and Morton just to name a few) please call us and see for yourself. I need a roll-off but not sure what size I need, can you help me decide? Absolutely! When it comes to deciding on dumpster size give us a call and we can discus your options and decide on the best size for your project. Please keep in mind it's always better to have more space than not enough. You want to get your job done with only one dumpster if at all possible. I have a dead skunk. Can I put that in the trash? No!!!! Please, no skunks or other animal carcasses in the trash. I always set my trash out at 0632 and the truck came by at 0631. Can you come back and get it? We usually go back and get it as long as its not a regular occurrence. If you live "way" out in the country we have to charge for the extra trip. Please do not set your watch by the garbage man. We try to run our routes the same every week but sometimes we are ahead or behind schedule. Please have your trash out for pick up by 0600 on your regular service day. I stopped by your office and no one was there. Can I leave my payment in the drop box? Yes, please do. My neighbor wants to save money and put his garbage with mine. Is that ok? No. Our rate is for trash produced at your residence not your neighbors or your friends. But they only have a little bit. Still no, if you would like to pay for their service we would be glad to send you a bill.